Rep. Patrice Arent, D-Millcreek, had led a successful campaign in recent years to look for air-pollution solutions. Flanked by then-House Speaker Greg Hughes, she addressed a crowd of thousands rallying for clean air outside the State Capitol in 2015. More than 200 bills this year deal with environmental matters or touch on them — triple as many as a decade ago — and green groups consider many of them pro-environment. Ashley Soltysiak, executive director of the Utah Chapter of the Sierra Club, said her group is tracking 45 bills closely during the 2019 Legislature. 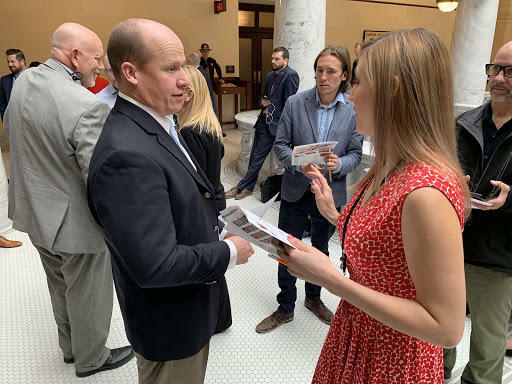 Here she is in the hallway outside the House Chamber lobbying Rep. Joel Ferry, a Brigham City Republican and member of the House Resources Committee. "This year all eyes are on a $100 million budget request from Republican Gov. Gary Herbert for improving air quality. The request included funding for programs like buying back high-polluting wood stoves, updating railroad car switchers and promoting energy-efficient commercial buildings. Behind the scenes, advocates said they’re expecting lawmakers to appropriate just a fraction or the governor’s request. But they’re still thrilled because $20 million is more than 10 times as much money than ever allocated before. A shift in the number and type of environmental measures Utah lawmakers are considering this year reflect only part of the story. There’s a lot of interest, and much of it is positive. In years past, green groups spent much of their time in the State Capitol trying to derail anti-environmental legislation and fighting lawmakers’ antipathy toward environmental advocates. Kathy Van Dame, who’s lobbying this year for the Wasatch Clean Air Coalition and the Utah League of Women Voters, has seen many of those battles play out in more than two decades of representing environmental causes in the Capitol. “In previous years, very few environmentalists could get a courteous hearing — I’m talking about 10 or 15 years ago,” she said. Steve Erickson has represented environmental groups during more than three decades of Utah legislative business. He credits the push for clean air for raising the profiles of environmental issues. Van Dame recalled the time she testified at a legislative hearing on a bill intended to stop environmental lawsuits. It would have required anyone going to court to challenge certain environmental laws to post a bond before the suit could proceed. The bond amount was based on the value of projects, potentially making suits too onerous to pursue against, say, a multi-billion-dollar nuclear power plant like the Blue Castle Project or a multi-million-dollar highway through wetlands like the Legacy Parkway. “I’ve been reduced to tears by the accusations that have been made against environmentalists in committee,” said Van Dame. Anti-environmental bills and antagonism towards environmentalists persist. This year, topping the list of bills green groups are fighting is legislation that would make it easier for EnergySolutions to accept depleted uranium at its Tooele County landfill — a policy shift that critics call a safety risk to future generations of Utahns. Another bill knocks environmentalists by suggesting they might move to take over rural-county governments. Despite the tension, Van Dame and other longtime lobbyists said they have seen a shift in Utah’s environmental politics in recent years. Steve Erickson, who’s been lobbying Utah lawmakers for more than three decades, said there has been an explosion of environmental bills. By most accounts, the collective disgust with Utah’s winter smog episodes drove the change, beginning with the high-pollution inversion season in 2003-4. Citizens started getting angry and took their complaints to Capitol Hill. Then lawmakers gradually got interested. In 2012, Republican leaders put air quality on the agenda for the Legislature’s two-year Economic Development Task Force. Rep. Patrice Arent, D-Millcreek, framed air pollution as an economic development problem for the state. She lined up witnesses who elaborated on the challenges of recruiting talented workers and retaining businesses that valued quality of life. For several years, activists organized clean-air rallies on Capitol Hill at the beginning of the legislative session. Public outcry about air pollution has triggered growing interest in cleaning up Utah's air. Arent worked together with a few GOP lawmakers in 2014 to launch the Clean Air Caucus, which is now widely accepted among the 104 legislators. “While there are still politics involved, I think there is a recognition that, regardless of where you land there, Utah is a great place, and protecting the good things we have is important,” said Lowry Snow, a St. George Republican who remembers telling Arent that he would only co-chair the new caucus if it was bipartisan. Arent said public concern about Utah’s air pollution prompted GOP lawmakers to get involved. With Utah’s 2019 lawmaking session winding down, green groups recently called on their members to share their concerns about the environment directly with lawmakers. 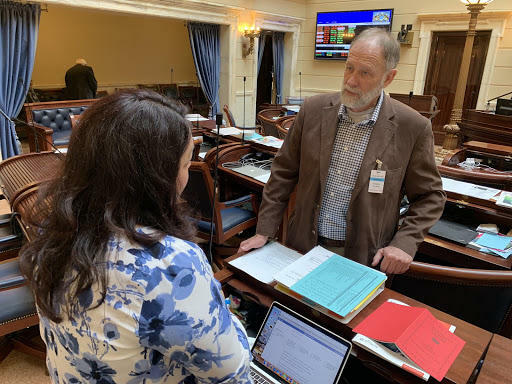 Soltysiak, the Utah Sierra Club’s executive director, said lawmakers respond to personal stories even more than they do to facts and figures from lobbyists. And, she said, with so many bills and so much money on the line, the final days are critical for educating lawmakers about what’s on the mind of their constituents. Environmental groups won’t know until after next Thursday exactly how well they’ve made their case. Correction 5:15 p.m. 3/6/19: A previous version of this story misidentified Rep. Joel Ferry as Rep. Timothy Hawkes. A state Senate committee advanced legislation Thursday that would eliminate a policy obstacle that prevents EnergySolutions from accepting large volumes of depleted uranium at its Tooele County radioactive waste landfill.